Cornelia Diamond Golf Resort & Spa 5* is rated 5.0 out of 5 based on 11 verified reviews from YGT customers. Found on Turkey’s magnificent Mediterranean coast, Cornelia Diamond Resort combines the best in luxury accommodation with a world-class golf course, creating the perfect setting for your golf holiday. The Cornelia Faldo Golf Course was designed by Sir Nick himself, commonly considered to be among the top two courses in Turkey, is ranked inside the top 100 courses in Europe as well. The lush, manicured fairways are a delight to play on, although Faldo’s clever use of bunkers makes this course a fair test as well. 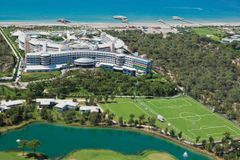 Located in the popular golfing region of Belek, the resort is just 30-minutes from Antalya International Airport, placing you within walking distance of the glorious beaches and lively town. The accommodation and leisure options at the Cornelia Diamond are extensive and exquisite, the rooms are luxuriously appointed, with your comfort in mind. As well as being beachside, the resort features 8 swimming pools, an aqua park, a spa, tennis courts, beach volleyball and more. You are equally spoilt when it comes to drinking and dining, with 10 fantastic bars and 9 remarkable restaurants to choose from. The resort is centrally located for access to the Faldo Course at Cornelia Golf Club, as well as the most attractive courses in the area. Some 8 a la carte restaurants, multiple bars and a terrific spa and leisure complex offer endless possibilities for guests visiting Turkey for a golf holiday. The deluxe hotel boasts a total of 575 standard bedrooms, as well as a huge range of suites and family rooms. Minimum in-room facilities include air-conditioning, safe deposit box, satellite flat screen television, direct dial telephone, internet access and a mini-bar, underlining that the Cornelia Diamond Resort ensures that you will have a truly memorable golf experience. The enormous Crassula Spa Centre is spread across two floors, and between three distinct areas, where guests can enjoy any number of indulgent beauty treatments; Turkish baths, massages, Russian steam baths and fantastic massages are among the favourites. It is almost impossible to experience all the culinary options at the Cornelia Diamond in one stay! Just returned from our holiday at the Cornelia Diamond, will certainly return. Golf was great, The Faldo course is very tight with lots if trees and water but fun to play - only 17 points! Montgomerie - wide fairways but a very tricky 18th hole - 37 points! Great 19th with food and drink all included. Carya was in beautiful condition getting ready for the Turkish Airline Open in November this year - 30 points. The transfers were excellent - always on time and very helpful drivers, looking forward to our next trip. I have been involved with the organising of overseas golf trips for my society for nearly 25 years and I have never known the process to have been so easy as on this occasion when I used yourgolftravel. We were looking for a fresh venue having been to Spain (both the mainland and the islands – Canary and Balearic), Portugal and Thailand to name but a few. Yourgolftravel recommended we try Turkey and our sales agent was able to give firsthand experience of the venue and the golf courses which I found to be invaluable. We stayed at the Cornelia Diamond Resort which was outstanding in every respect and incredibly good value for money. All of the golf courses were within a 10 minute bus transfer from the resort which made the whole experience very efficient and comfortable. We played The Montgomerie Maxx Royal, Carya and Sultan, as well as others. These three courses are now in my top 10 in the world, having played all the Wentworth courses, Sunningdale and all the famous Spanish, Thai and Portuguese courses. Quite unexpected! I could only sum it up by saying the holiday was spectacular and 10 out of 10! A similar rating would only be fair for my dealings with YGT. We had a great trip to Turkey and thoroughly enjoyed it. The Faldo Course was in good condition and really challenging if you miss the fairways. The clubhouse was great too. Really smart and the staff were welcoming and provided really good service. We didn’t use the bar or restaurant but the changing facilities and practice areas were both superb. Cornelia Diamond on the whole is amazing value for money with great choice throughout in terms of accommodation options, food and leisure facilities. It is definitely a five star hotel with spacious and well appointed guestrooms, attentive staff and fantastic evening entertainment. The all inclusive aspect make is incredible value for money too. Overall verdict? If I could award 11 out of 10 I would. Our holiday to Turkey was brilliant. The transfers were excellent and all on time and the service throughout was fantastic. All of the people in my party who have not been to Turkey before said they would definitely go back. The hotel was amazing and service was excellent. Our favourite golf course we played was the Cornelia Faldo course and we will definitely come back to play it again, as well as some others that were closed at the time of year we travelled. Maybe we will come back earlier in the season next time! Thank you to YGT for an excellent service. The trip was just what we had hoped for and the service provided by Your Golf Travel was excellent throughout, with all our requirements met and expectations exceeded. Belek is a great location for golf breaks & the Cornelia Diamond was a superb hotel. The Faldo course was in great condition, but I felt was a little too tough/unforgiving for us mid-high handicappers. I would love to try the other courses in the future. I would have no hesitation in recommending Your Golf Travel's services to friends and colleagues. My preamble for the feed back definitely has to be about YGT, who we found to be a very professional & efficient travel agent specialising in golfing holidays both at home & abroad. Our golfing trip to Belek (Turkey), staying at the 5 star Cornelia Diamond Hotel was an exceptionally fulfilling and enjoyable experience. The hotel being an all inclusive package made our stay very relaxing without the daily hassle of seeking out restaurants or mulling over where to go. The hotel staff / guest relations were very good, convivial & created a pleasant milieu. They were always at hand to help & serve. It is a genuine quality 5 star hotel plus. Evening entertainment at the hotel lead to a well rounded day experience. The golfing experience likewise was memorable, playing at courses such as Carya, Pasha & Cornelia Faldo. The quality of the club houses, as well as the courses which featured excellent fairways & greens was clear to see...I am sure the average stimp speed was 11 plus for the greens! The courses' designs were also excellent & at times challenged us to generate "better" golf. I would definitely recommend YGT to all of our golfing friends and indeed will return to Belek soon if not annually. Just wanted to say a massive thank you to Your Golf Travel for a fantastic golf holiday to the Cornelia Diamond resort. We couldn't fault a single thing. The hotel was fantastic, the golf courses were great and we experienced excellent customer service wherever we went. An all round great experience. We look forward to booking with you again in the very near future. Our trip to Turkey was fantastic. On arrival at our hotel we were even upgraded to a huge luxurious suite with an equally huge balcony! The hotel itself was absolutely stunning in its design and in the facilities it offers. Nothing was too much trouble for the staff and we were even greeted with champagne on arrival. The thing that impressed me most however was the food. Never in my life have I seen such a variety of food in one place - all beautifully presented and of the highest quality. As for the golf, the courses were among the best I have ever played. So impressed were we that we arranged an extra game while we were there. We'd heard the Sultan was something special and it didn't disappoint. In fact I'd go so far as to rate it higher than my other favourite courses - Downfield, Turnberry Ailsa and Carnoustie. Of course it helps when you catch every fairway! Sadly, I hit a few of my approach shots sideways but, despite this, I did manage back-to-back birdies at 15 and 16 which was the highlight of my week from a golfing perspective. The other two courses we played were the Faldo and the Carya which I also enjoyed greatly. I'd find it hard to believe that anyone could visit the Cornelia Diamond and come away disappointed. I'm already thinking about going back for a holiday with my wife in April. This was our fourth consecutive trip to this hotel but the first time we have booked through 'Your Golf Travel' and I have to say we were more than impressed. The rep from Noyan Travel was there to greet us at Antalya which made the transfer to the hotel quick & actually quite enjoyable. He was brilliant as were the rest of the transfers from hotel to golf courses; always there to pick us up on time. My husband commented on the high quality of the golf courses & transfers to & from the hotel and although my husband & his playing partner had previously played at all courses, they were full of praise for the overall experience of booking the holiday through Your Golf Travel. We will most definitely be a returning customer! We had a most enjoyable two weeks at the Cornelia Diamond Golf Resort & Spa 5* in Turkey, leaving the UK covered in snow to arrive in Turkey to a delightful warm & sunny climate - most ideal for golf. We played the National, Carya and Cornelia Faldo courses while we there and found all of them to be in great condition and challenging too, but not too difficult for the average golfer with plenty of tees to play from depending on your ability. The transfer people were very polite, helpful and always punctual, arriving before time for our pick ups. The hotel room was well laid out and extremely clean and there were members of hotel staff always at hand to help or chat. Food and drink was excellent and plentiful thanks to our All Inclusive package and we thought the variety of food in particular was immense and could be had at any time of the day or night. The free mini bar was also well stocked with soft drinks, alcohol and chocolate. In fact the whole holiday went perfectly! We have stayed in many hotels around the world but this hotel is right up there amongst the best and we'd have to rate it as a 10/10. We hope to book again with you soon. What a fabulous hotel! Loved the spa, the location and the amazing restaurants. We would not hesitate to visit again.